This image is Tea.L.C digital stamp by Just Inklined and it is Bertha having a well earned cup of char. Coloured with Copic Markers and Prisma Pencils background papers by Papertrey Ink a ribbon a couple of pearls and a bit of love to bring it all together. I tried to get a glowing appearance coming from the lamp behind Bertha, you can tell she's done all her housely chores and is now having a little well earned ME time. Absolutely gorgeous Jak, she's fantastic and i love her glasses. You really got that glow from the lamp just perfect! I love your card!! 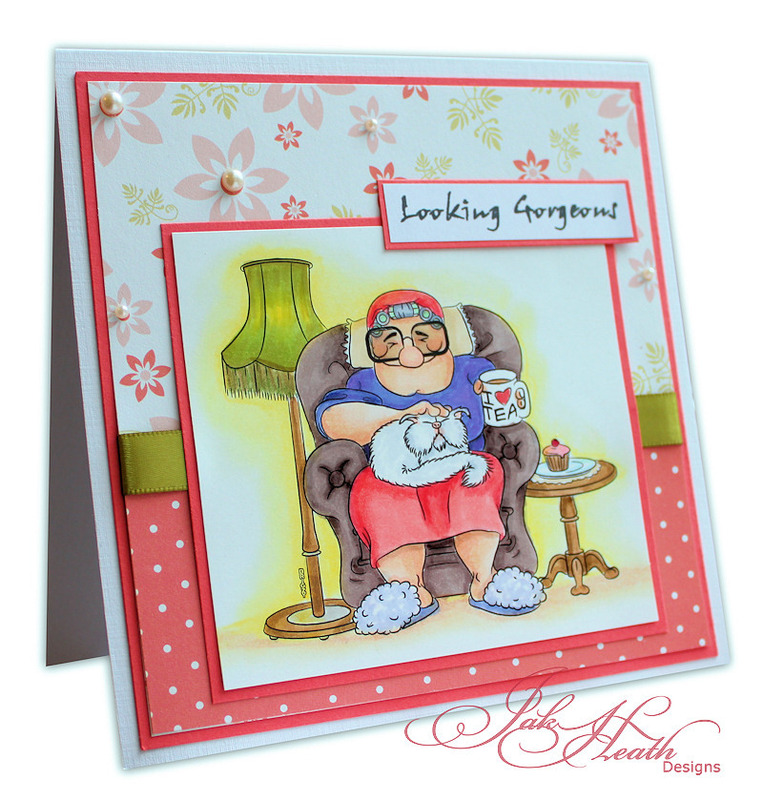 Made me smile great card love the background paper. Brilliant Jak...just love her 'Dierdre' glasses Hee! Hee!.... and beautiful colouring. She's absolutly geourgious !! Great stamp and card ! Jak your card make my day!, so funny and gorgeous image. Jak, This is hysterical...Love it!! What a fun card! I will definitely put this image on the top of my wish list. Thank you! 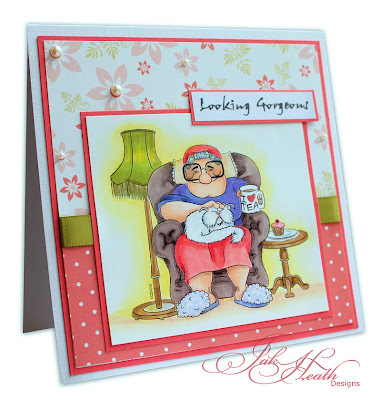 Your card is a HOWL Jak and I love your carefully chosen caption..but would you send it to anyone? If so, you're a better man (woman) than I am Gunga Din! Mary I'm sending it to my Mother in law and she'll love it. She has an amazing sense of humour. Jackie, I have to stop looking at your blog...I just adore her! It is really freaky how my hands immediately took me to your store and took me through the process to purchase her. Thanks from Canada for such awesome stamps. Oh Jak I do hope you are right - I wouldn't risk it for a biscuit, not for all of McVities!!! 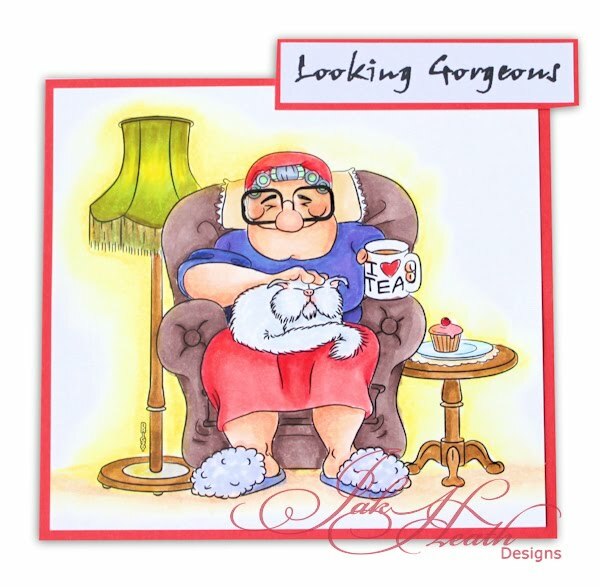 great card Jak, love bertha she reminds me of my mother-in-law, who is at rest now. This is just wonderful Jak. That image is just brilliant!! Beautiful bright colours.